The stacks of the Baghdad National Library hide a treasure of the ages. Crinkled, yellowing papers hold the true stories of sultans and kings. They tell the stories of occupation and liberation. They also tell the stories of war and peace. These are the original chronicles of Iraq's rich and unstable history. Now librarians and academics in Baghdad are working busily to preserve what's left. That is after thousands of documents were lost or damaged. That happened at the height of the U.S.-led invasion. Islamic State militants had set out to destroy Iraq's history and culture. The losses included rare books and manuscripts. They were kept in the militant-held city of Mosul. Now a major preservation and digitization project is underway in the capital, Baghdad. The goal is to protect a millennium worth of history. Employees use specialized lighting to photograph some of the most-precious manuscripts. They work in darkrooms in the library's back offices. Mazin Ibrahim Ismail is the head of the microfilm department. He said they're testing the process with documents created under Iraq's last monarch That is Faisal II. He ruled from 1939 to 1958. The repair process is nothing short of microsurgery. The type of damage to each document is a story on its own. It is also a puzzle. 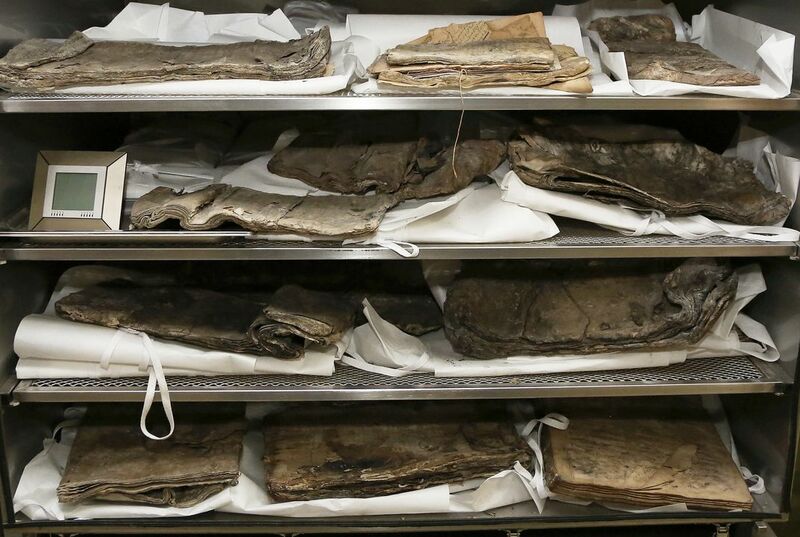 Some manuscripts are torn from overuse and aging. Others are burned or stained from attack or sabotage. And then there are some that were completely fossilized over time. That was due to moisture and very hot temperatures. They look like large rocks. 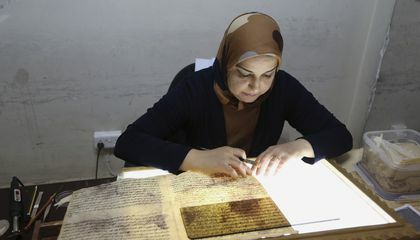 "Those are the most difficult books to restore," said Fatma Khudair. She is the senior employee in the restoration department. She uses a specialized tool. She said it uses steam. It helps to loosen and separate the pages. "Sometimes, we are able to save those books and then apply other restoration techniques. But with others, the damage is irreversible." Technicians clean manuscripts and documents for 48 hours. They wash them of dust and other impurities. They have collected over time. Then, they go page by page using Japanese tissue. It is specialized paper for book conservation and restoration. The technicians fill in torn edges. Or they layer the more-delicate documents with a sheer coating to make them stronger. The Baghdad National Library was established by the British. That was in 1920. Donations were used to pay for it. The library was first led by a Catholic priest. It has stood up against violent disorder before. At the start of the 2003 U.S.-led occupation, chaos gripped the capital. Arsonists set fire to the library. The fire destroyed 25 percent of its books. Almost 60 percent of its archives were lost. They included priceless Ottoman records. Archives from 1977 to 2003 burned to ashes. There were earlier archives from 1920 to 1977. Those included important Interior Ministry documents. They had been stored in rice bags. They survived the blaze. documents were exposed to water. This was because the American tanks destroyed the water pipes." Water then leaked onto important cultural materials. Around 400,000 pages of documents and 4,000 rare books were damaged when the pipes broke. Some of those dated back to the Ottoman period. The damaged documents also included the library's precious Hebrew archives. Most of those later were moved to Washington. A team of experts from the Library of Congress in Washington visited Baghdad. The group helped measure the damage. The team suggested building a new national library. More than a 10 years later a 484,380-square-foot replacement is nearly finished. It is state-of-the-art. It is scheduled to open next year. It was designed by London-based AMBS Architects. Until then, the Baghdad National Library is looking to help those in conflict-ridden areas. They want them to enjoy and appreciate Iraqi culture. Library officials say that sharing Iraqi art and literature is key to fighting terrorism. In recent months, the library donated around 2,500 books to libraries in Iraq's Diyala province. That was after Iraqi forces recaptured towns there from Islamic State militants.